Recipe Borscht - A Potato Version of This Popular Russian Soup. What is the Glycemic Index? (1) Place shredded cabbage, half of the chopped onion, diced potatoes, shredded carrots and salt in a large stockpot or Dutch oven. Cover with water and simmer until vegetables are partially soft. Add tomatoes and spinach. (2) Make a “rue” by sautéing the other half of the chopped onions in oil, adding flour and cooking until light brown. Add to soup along with the dill weed. (3) Simmer until all vegetables are soft. (4) Remove from heat and stir in sour cream, if desired. Another way to do this is to serve hot soup with a dollop of sour cream, rather than mixing it into the whole pot. This way you can avoid the risk when reheating the soup of boiling it and causing the sour cream to curdle. Dill seasoning may include the aromatic seeds, leaves and stalks of the dill plant. It is often used in Russian cuisine, such as in this recipe for borscht. The seeds have a stronger flavor than the leaves and stalks. Dill is used to make pickles and may be a digestive aid with useful anti-cancer properties. It is a good source of Vitamin A, Riboflavin, Folate Vitamin B6, Vitamin C, Manganese, Iron, Calcium, Magnesium and Potassium. Besides this soup recipe, dill can be used as a garnish and to flavor egg salad and potato salad. Phytonutrients are plant nutrients found in fruits, vegetables, grains, spice and herbs that seem to have a positive, disease-preventing effect on your health. For example, Potato borscht contains allicin from the onions—which may reduce blood pressure and has an anti-microbial effect, beta-carotene from the carrots, for protection against heart disease, vision loss, memory loss, cancer, and complications from Type II diabetes, sulforaphane from the cabbage, which may protect against cancer, saponins from the tomatoes, which seem to stimulate the immune system and phenolic acids from the potatoes, which also have anti-cancer properties. This soup gets better with age, so enjoy the leftovers! 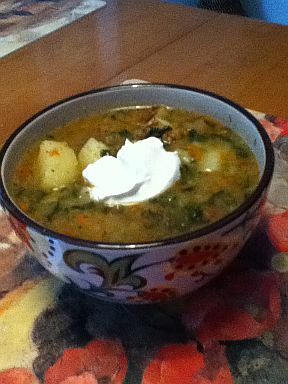 Click here to go from Recipe Borscht to Making Soup page. Have a question about eating healthy? Get answers to your healthy eating questions. A description of omega fats - the two types and how they form part of a healthy diet and lifestyle. Don't miss out on the benefits of healthy eating, that can help you feel better and live longer. Add fiber to your diet, a small step you can take toward your goal of eating healthy. In order to cover the cost of maintaining this free website, revenue may be generated by ads and links to other sites. However, although we encourage you to click on those ads that interest you, providing ad space for the sake of revenue is by no means an endorsement of any product or service, unless the endorsement is specifically stated. Disclaimer: The information on this site is provided with the understanding that the author and publisher are not providing medical or nutritional counseling, and that it in no way replaces consultation with a health care professional. © 2019 by Mission Enabled All rights reserved.